Uhmm... where should I begin? 1978 - I buy my first "real" musical instrument: a Farfisa VIP-370 electronic organ; it will take over 3 years before buying my first microphone. 1979-81 - attending the Conservatory of Milano; courses: electronic music, subsidiary piano, theory & solfeggio; in the same period I begin playing keyboards and singing in amateur bands, including one called Feedback: despite its name, it's not a hard rock band, but a cover-band mostly oriented to pop. November 15, 1988 - it's the birth date of my first "serious" band, named OverTime; this group will be my only musical activity for years. At first, nobody took the role of the lead singer, but after some rehearsals the duty is assigned to me. In the same period I buy my first personal computer for music: it's a glorious Atari ST Mega 2, with the musical software C-Lab Notator; and I will use it for creating my first compositions. 1993 - After passing the mandatory exams, I join SIAE as "melodist composer" and "lyrics' author". December 28, 1996 - I participate as a soloist to a singing contest, winning the "critics' award". September 21, 2001 - after a long period without big news on the artistic side, mostly due to my heavy (non musical) daily job, I leave my job as an employee to become a freelance, trying to gain some free time to spend on my artistic passion. May 21, 2002 - recording (and lyrics writing) of "Go Up! ", the only sung track (in "rap" style) to be included on the first album of the funky-jazz band Mike Painter & The Family Shakers; the album is published the year after and the song is then chosen for backing a TV ad. After the publication of the record, I begin gigging with the Family Shakers, also thanks to the increasing number of non-instrumental songs in the repertoire of the band. November 2002 - I join the school "Nel Centro Della Musica" (NCDM) in Cusano Milanino (Milano); courses: individual singing (teacher: Simona Scuto), choral singing (teacher: Sabrina Olivieri), ensemble music and harmony (teacher: Giancarlo Porro), and theory & solfeggio (teacher: Maurizio Dosi). 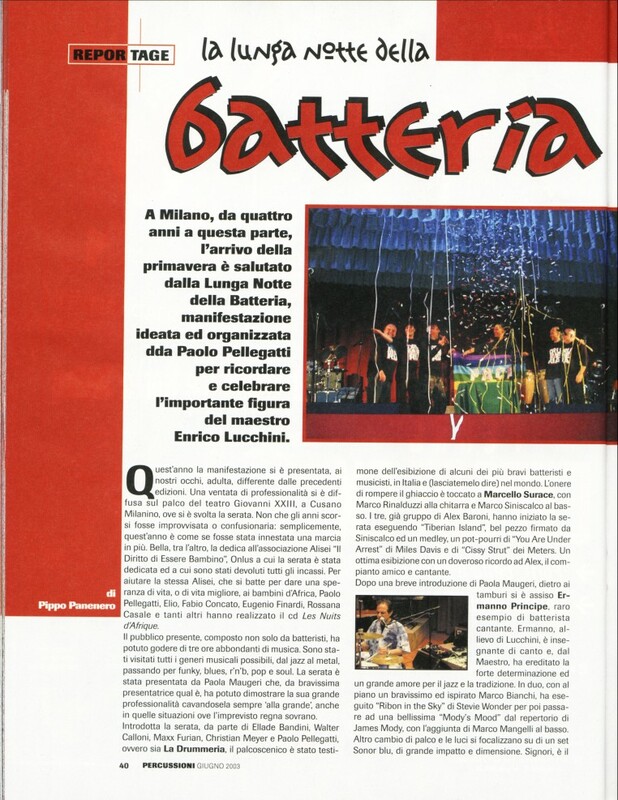 April 2, 2003 - I sing a 60's Soul classic, "Get Ready", at the show "La Lunga Notte Della Batteria - Omaggio a Enrico Lucchini" ("The Long Night Of The Drums", an event dedicated to the memory of a famous Italian drummer), with high-level musicians of the Italian scene; I'm the only non-professional soloist to be involved in the event, and in the backing band for my performance I'm honoured by the presence of musicians like Gianni Dall'Aglio (drummer in the historic Italian band I Ribelli and with Lucio Battisti, and more), Andrea Tofanelli on trumpet, Luca Meneghello on guitar, together with Giancarlo Porro (see above) on saxophone, and a trio of students of the NCDM school as backing vocalists: Marika Genchi, Debora Maffei and Gianni Piga. May 11, 2003 - I attend a seminar by Maria Pia De Vito, the world-level jazz vocalist, at the CEMM music school in Bussero (Milano). July 13, 2003 - I attend a workshop about "acappella" vocal music with international artists such as the bands M-Pact and House Jacks plus members of the Flying Pickets and Neri Per Caso, organised by "SoleVoci" in Varese. June 12, 2003 - NCDM school concert; I sing four songs with the school's gospel choir, one song in a jazz vocal quintet, three songs as a soloist and one in duo with Gianni Piga (see above). September 1, 2003 - recording of the hymn-song of the "Lega Italiana Sclerosi Multipla" (LISM, Multiple Sclerosis Italian League). November 2003 - I replace, for three shows, one of the soloists of the vocal sextet Rainbow Singers, whose repertoire includes gospel, swing, blues, jazz, soul and Afro-American music in general; the band has already issued an album, and my collaboration with them will not end with this chance. December 15, 2003 - charity contest at the "Spazio Capitol" in Vimercate (Milano) on behalf of LISM; I sing an Italian pop song in duet with Daniela "Dana" Vimercati. June 2004 - I replace the lead male vocalist (well, two...) in The Marcus Pepper Love Revue. 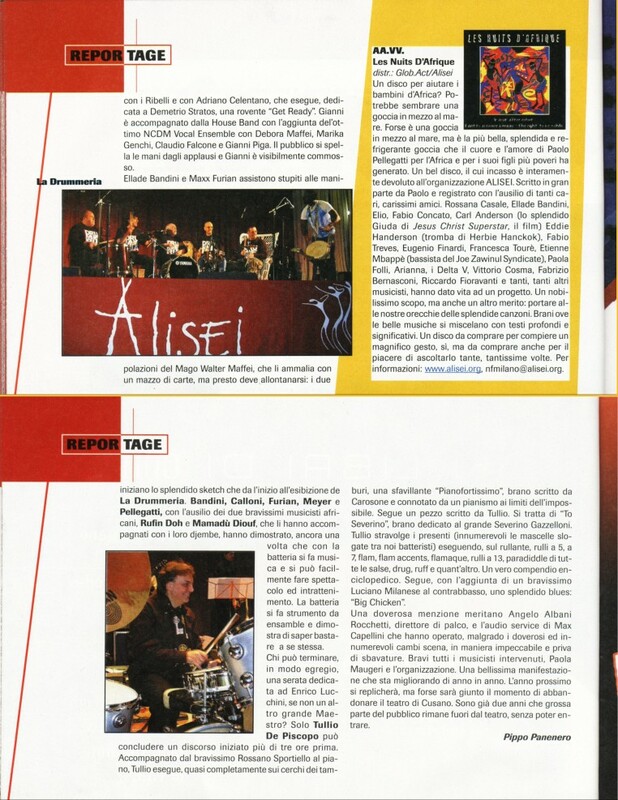 June 2004 - I begin my collaboration (not as a musician) with the agency Verdearanciomusica, specialized in Italian and international jazz; on March 2006 I decide to stop my partnership. September 2004 - I start my personal Internet site (this one). November 2004 - I join a new "contemporary gospel" choir; the project is an idea by Sabrina Olivieri and Marco Evans, two members of the Rainbow Singers. March 6, 2005 - about 4:30 a.m.: I completed the revision of my book which I worked on for so long (since 2002): it's titled "My Music Machine" (sorry, no translation planned so far). March 18, 2005 - first live date for the contemporary gospel choir (still nameless) started in November 2004: at the "Tsunami Concert", a benefit concert organized by the NCDM school, where the choir has access for rehearsals; the event is on behalf of the victims of the seaquake of Sri Lanka happened in December 2004. The flyer of the event can be downloaded here . April 14, 2005 - at the second edition of the charity vocal contest on behalf of LISM, I win two of the three available awards: "best interpretation" and "most original idea"; the success is obtained also thanks to the backing vocalists that supported me in the execution of the song ("Unchain My Heart"), the three fantastic singers Simona D'Agostina, Marta Ferradini and Alessia Piantoni. May 2005 - I begin collaborating with the chamber group Caronte, a very special group with variable lineup having several different high-quality musical programs in its repertoire, including a rendition of "Jesus Christ Superstar" (for which I'm asked to join them) with a voice-overing actress, three vocalists (besides me, Piergiorgio Pardo and Sabrina Olivieri of the Rainbow Singers) and an instrumental quintet between classical and modern: piano, electric bass, harp, violin, and sax or clarinet. As a soloist, my characters are Caiaphas, Pontius Pilate and Jesus. 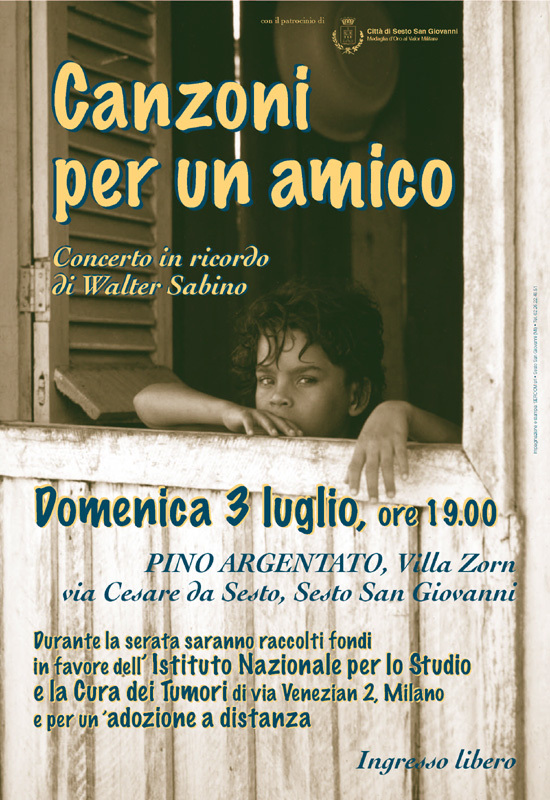 July 3, 2005 - I present the 4-hour concert "Canzoni Per Un Amico" (Songs For A Friend), with several artists and bands joined on stage in memory of Walter Sabino, a great person, journalist, musician (a wonderful bass player), and a friend of mine, who died in february for a brain cancer whe he was only 34; at the end of the night I sing three songs, after having also joined the contemporary gospel choir directed by Sabrina Olivieri for 4 tracks. The flyer of the event can be downloaded here. Summer 2005 - From the "ashes" of the Marcus Pepper Love Revue born the Blue-Eyed Soul Team, which records a demo CD of five songs. My presence in the band will end in November 2006. September 12-13, 2005 - I attend a gospel & jazz choir vocal workshop, based on the Sacred Concerts of Duke Ellington, with the World Chamber Choir & Voceversa Jazz Company, organised in Milano by the "Tagger Foundation". January 2006 - a new project is born: an expanded lineup of OverTime for assembling a show based mostly on the Quadrophenia rock-opera; the new band is baptized OverBox. In the first months of 2006 this sextet begins to rehearsal; a detailed description of this project is available on its dedicated page. May 2006 - after the completion of two demo tracks, the project Wasabi Devotion (a studio-oriented Dance-Electropop trio) has finally his official name and begins his diffusion on the Net; the first contacts for involving me as singer and author occurred in November 2005. June 25, 2006 - second edition of "Canzoni Per Un Amico" (Songs For A Friend): first official live showcase for the OverBox project; I also sing a song with a band assembled just for the occasion. The flyer of the event can be downloaded here . August 25, 2006 - after a bunch of rehearsals, here is my first concert with a new "hard blues" band which later will be ironically called "The Burpers". September 25, 2006 - I join a course on (italian) diction at the CTA (Centro Teatro Attivo) school in Milan, with the teachers Mietta Raimondi and Emiliana Perina; the latter will involve me in some theatrical and musical activities during the following months. January 29, 2007 - at the Teatro Carcano in Milano it's the day of the musical comedy "L'Arlecchino", a project conceived and directed by Emiliana Perina (see above): it's my theatrical debut, as a singer and actor. 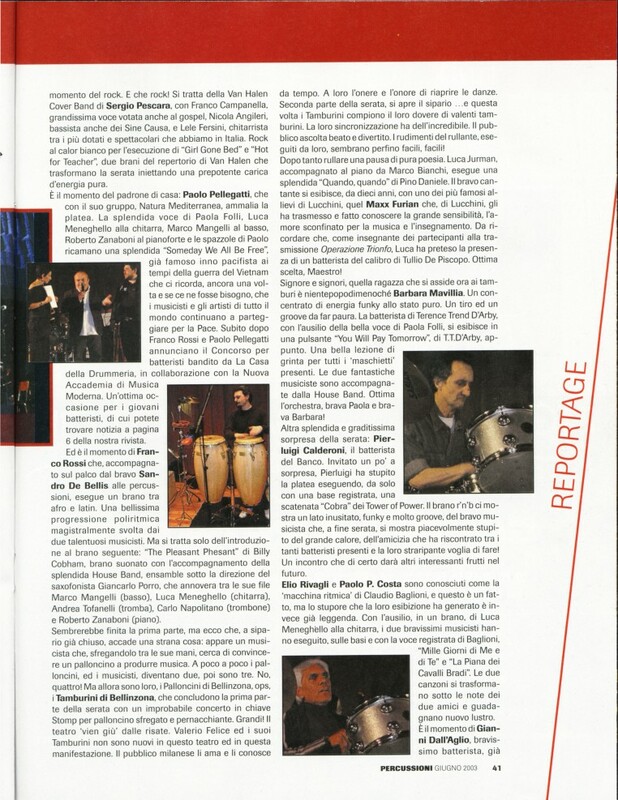 July 2007 - the July/August issue of the magazine "Percussioni" includes an article written by me about the online petition against SIAE which I launched in April; it's my first "official signature" on the press. October 2007 - back to study again at the "Sbaraglio" music school; this time I join the courses of modern piano (teacher: Fabrizio Bernasconi) and harmony (teacher: Antonello Monni). December 21, 2007 - my first official TV appearance: with the SO Gospel Choir I participate to a live show aired on the local TV "TeleLombardia" singing four songs, including one as lead vocalist . October 2008 - I continue studying harmony with Antonello Monni but privately, in a restricted group of students. March 12, 2009 - publication of the first Wasabi Devotion single, titled "Love Yourself". June 27, 2009 - publication of the second Wasabi Devotion single, titled "Overloving You". April 23 and 24, 2010 - after five years of preparation, "Who's Jimmy", the show by OverBox, comes on stage. July 21, 2010 - I join Alphataurus, historical band of italian Progressive Rock of the Seventies, reassembling after more than 35 years; November 6 is the date of the official comeback on stage, as part of the "ProgVention 2010".